Segmenting your campaign will greatly increase its relevance and improve your open, click and conversion rates. Segments can be easily built based on your product catalog and customer behaviors. 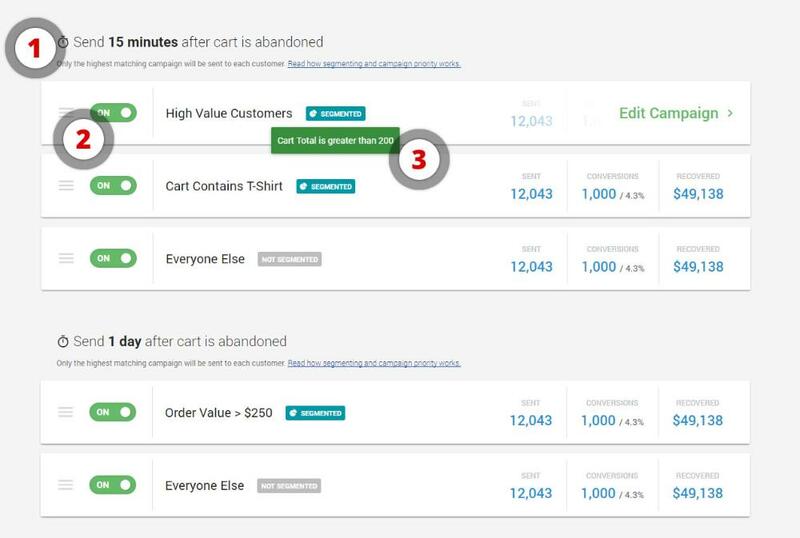 When you setup a new campaign, you choose the time delay after a cart is abandoned before the email is sent. This delay can be in minutes, hours or days. We automatically group matching time delay emails into a single time slot. So if you want to add an additional email to the 15 Minute time slot, simply add a new campaign and choose 15 Minutes as the time delay. If you create a campaign with a 16 minute time delay, we will automatically create a new 16 minute time slot for you. Campaign priority determines which email is sent first. We only send the first matching campaign from each time slot to a customer. That way a customer will never receive multiple emails 15 minutes after their order. They only get the highest priority matching campaign. This enables you to give preference to some segments. So if you want to be sure that any high value customers receive your High Value campaign, that email should be ordered first. You can re-order your emails by simply holding and dragging the 3 bar icon on the left. Segmentation is a very powerful way to make your emails more targeted and relevant for each customer. Instead of just sending the same, simple email to everybody, why not send an email that speaks directly to the products they abandoned? If they abandoned a t-shirt, send them an email explaining why your t-shirt is the best! We have created a couple simple segments to give you some ideas and start with. For more detail on how segmenting works and some more examples, visit this article.